Norwegian Prime Minister Erna Solberg has said her government will pay compensation for policies discriminating against Romani people before, during and after World War II. 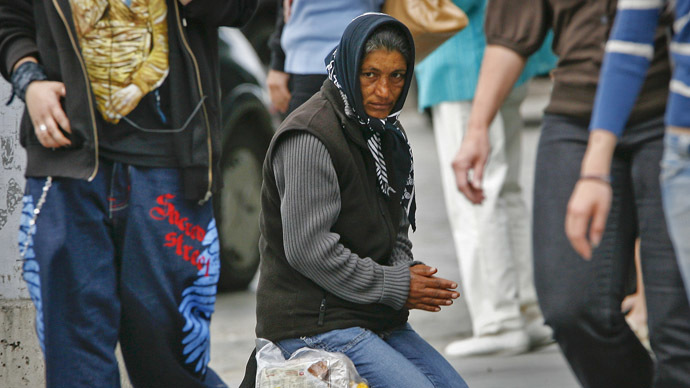 The move comes two months after a botched plan to crack down on Romani beggars. She was referring to the findings of a government-commissioned report, which detailed how Norwegian authorities blocked Romani citizens traveling abroad from reentering the country. The practice started in the 1930s and didn’t end with the war, as some Norwegians of Romani ethnicity couldn’t return home for 10 years after it ended, the report said. Researchers said there were 100 to 150 Romani citizens living in Norway in the 1920s before the discriminatory reentry bans started. They identified 62 people who ultimately died in Nazi death camps after being barred from reentry. The report said more research was needed to establish the fate of Roma people who were still living in Norway when it was occupied by the Nazis. The report was published in February, just as the Norwegian ruling coalition proposed new legislation that would criminalize begging and assisting beggars in the country. Since last year, municipalities have been allowed to adopt their own rules on begging. So far, only one has chosen to do so, but the new law would have been enforced nationally. The proposal was widely viewed as targeting Romani immigrants, whose numbers have increased tenfold in Norway since the global economic crisis of 2008. Renowned for its comprehensive welfare system, Norway was viewed by some struggling Europeans as a promising destination to go and seek a better life. The rationale behind the legislation was to crack down on organized begging and crime associated with it. “We need to give the police the legal authority to crack down on people who arrange for beggars to get here, often in large groups,” Norwegian Justice Minister Vidar Brein-Karlsenhas argued at the time. The proposal was harshly criticized both inside the country and internationally. Critics said it would in essence outlaw charity, victimize the needy and discriminate against the Romani people. “My immediate response is that I don't see this as the solution for Sweden – turning offering or asking for help into a criminal act,” he told The Local news portal. Amid the outcry, Norway’s opposition Center Party withdrew its support for the controversial legislation. PM Solberg’s Conservative Party and its junior partner in the government coalition, the anti-immigrant Progress Party, decided to drop their initiative.